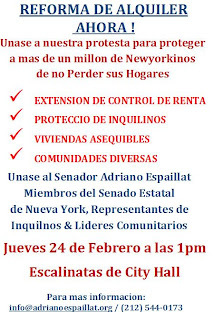 Saturday: Rally for Rent Reform in Queens! The Real Rent Reform is sending Valentine's Day cards to Sheldon Silver for supporting renewing and strengthening the rent laws now, and to Governor Cuomo to URGE him to show a little love to tenants by doing the same. Go to http://save-ml.org/files/R3%20Valentine%20Poscard%20to%20Cuomo.pdf to download the cards for Cuomo (4 on a page), and to http://save-ml.org/files/R3%20Valentine%20Card%20for%20Silver.pdf for the cards for Silver. (Note: When you print out the cards for Silver, you will probably have to reverse the page orientation - despite what your printer says about 2-sided copying - to get it to come out right.) You can find and download them from that you can print out on 8.5" X 11" paper (for Silver) and card stock (for Cuomo), cut, and have tenants in your building sign. This Thursday: Brooklyn Kick Off Rally for Rent Reform!